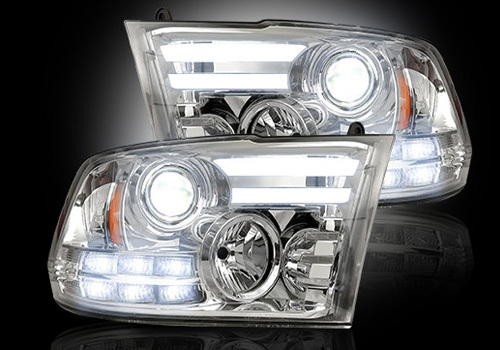 Chrome LED Halo Headlights 09-18 DODGE RAM w/Factory Projectors Recon Chrome LED Halo Headlights w/ Factory Projectors 09-18 DODGE RAM, Chrome LED Halo Headlights w/ Factory Projectors 09-18 DODGE RAM, Chrome Headlights w/ Factory Projectors 09-18 DODGE RAM, Chrome LED Halo Headlights 09-18 DODGE RAM, [Recon 264276CLC Head Lights] - $899.95 : 3rd Strike Performance, Your Source for Late Model MOPAR Performance Parts and Accessories! LED lights are built to be ultra-bright so that they can be seen in both light and dark environments during the day and night. If you want to be able to use your halos all the time, you should choose LED. These rings are also slightly more durable than CCFL and are built to last for 60,000 hours of continuous use. For trucks with Factory Projector Headlights only!